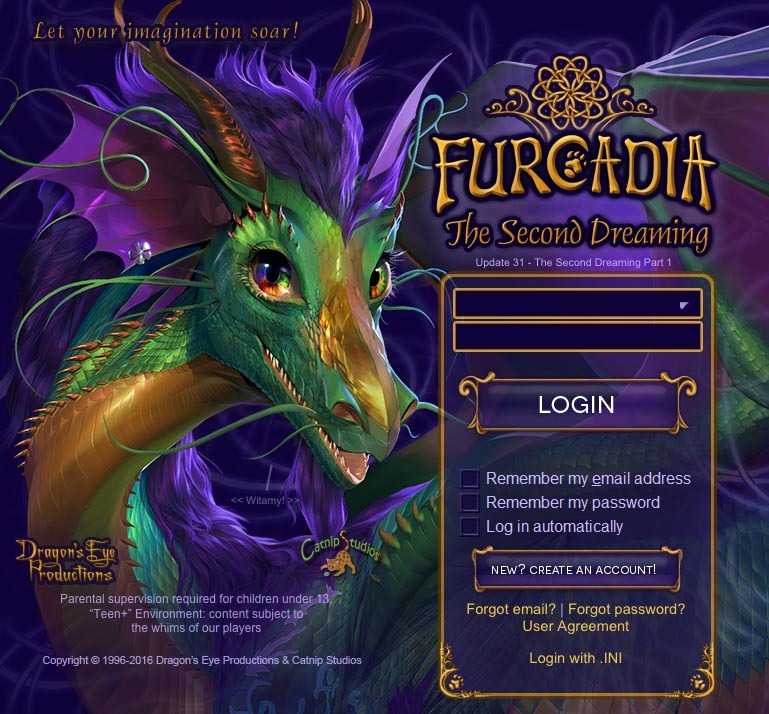 This is Furcadia's biggest update EVER! Please welcome Update 31a, The Second Dreaming Part 1, a vibrant, fully 32bit world! As the name implies, this update is so massive that it had to be separated into 2 parts! Have a look at all you get in this first half! Welcome to the new FurEd, a hub for editing and creating characters on your Account - from any device with net! Easily select color Dyes by mousing over and clicking large new character art. New backgrounds give you the feel of entering a magical world. View Digos you own and ones you've never seen before - all in one place! Create Costumes and set your colors, Digo, description, portrait, specitag, and more! Set a standard for each costume, too! Give yourself more options for customization with brand new Wing and Accent Remaps! The original color Dyes are also now prettier with a full range of values! AFK settings, color strings, and more are now all in one place, with modern interface! Set colors, Digo, port, desc and more for when you go AFK - for each costume! Making characters just got easier! Names are created with your email, gender and species taken into account! The new Description generator also helps you hop straight into the game! The defaults now look brand new, and can be male/female/ unspecified! That's 11 species with 3 genders, so now you can choose from 33 free options for your characters! Furcadians have asked for years - and now they're here! Wings, wings, and more wings! Now you can wear wings on more avatars! Includes ALL defaults, ALL Nobles, and Anthros like the Lichenthrope, Raccoon, and Wyrmme! Never before seen but exceptionally awesome: Dragonfly Wings! 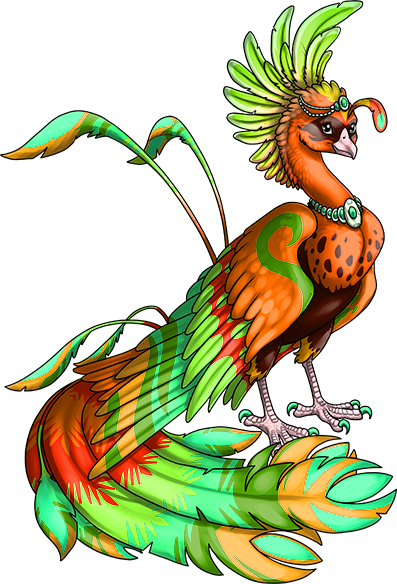 Wear them on all your favorite Anthro avatars! Let your imagination soar to a whole new level with a fully redesigned world building tool: the 32bit Dream Editor with fancy UI! Modern mode grants you 32bit patches, lighting, and other new features, while Legacy mode preserves backwards compatibility. Modern mode Dreamers also enjoy a simpler patch structure with fewer files to deal with, new custom Dream Portals so others can upload sub-Dreams in style, +20 local species at every Group package tier, and tons more! 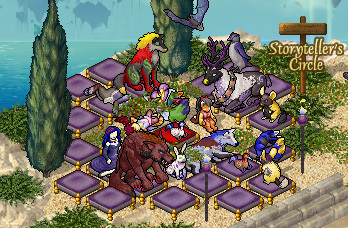 Furcadia's taken a turn for the more vibrant! Update your Dream to Modern Mode and experience tons of new features, including the long sought after 32bit colors, Lighting layers, and more! 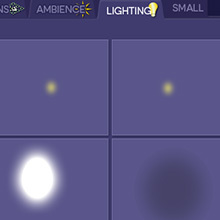 Use the 2 new Dream layers, Ambience and Lighting, to add lively atmosphere to your Dream! Cycle between day and night seamlessly, add atmospheric haze like mist or dust, or use blend modes to create brand new types of experiences! Test out double size patches and fit everything together just how you like it with the new Large size preview in DreamEd! Right now Large size uploads are disabled, but this tool will help you get your Dream ready in time for Update 32 when Large size uploads will (hopefully) be ready. Redesigned and recoded from the ground up, the brand new 32bit Fox Editor revolutionizes patching! Modern interface makes learning new features easy, and tons of new tools simplify the process of creating art for your Modern Mode Dreams! And don't worry - the old FSH Editor is preserved as a separate editor for backwards compatibility. This new format has high functionality, letting you customize your patches the way you've always wanted to. Different types of Objects now have labels with specific inputs that help you pinpoint everything you need. Floors, Walls, Items, Effects, Lighting, Ambience, Avatars, and more - all are different types of patches that you can differentiate with FoxEd! Patching in Furcadia used to be so complicated, with lots of different files involved. But now the new Tabbed Hierarchy in the FOX5 format will help you create in a more organized fashion! Compare your large and small size patches simply by switching tabs! Furre and Object positioning are preserved when you auto-resize your objects too! Names, descriptions, artists, and other metadata are now part of the new format. Of special note is new Patch Licensing! Many Object types also have a Usability section for making stuff kickable, flyable, swimmable, etc. Walkabouts in Furcadia have long been complicated - but with new Avatar Objects, everything is combined! View different poses in the drop down, while portraits and specitags each have their own tab. We're thinking forward - when we modernize the interface of Furcadia next update, we'll use these pretty new icons! Currently FurEd utilizes icons in the interface for selecting your character's Digo. Besides the regular Drawing layer that you're used to, there's an additional 4 new layers to work with! Add translucency with pencil and fill bucket tools using the new Alpha layer! If you want even more control over 32bit, you can import image files over to FoxEd. Palettes be gone! Remaps layer is separate with new easy-to-use unique icons! Easily paint on Remaps right where you want them! It'll automatically make the shading layer grayscale! Shadows won't get in your way! They're on their own layer, and are toggle-able! 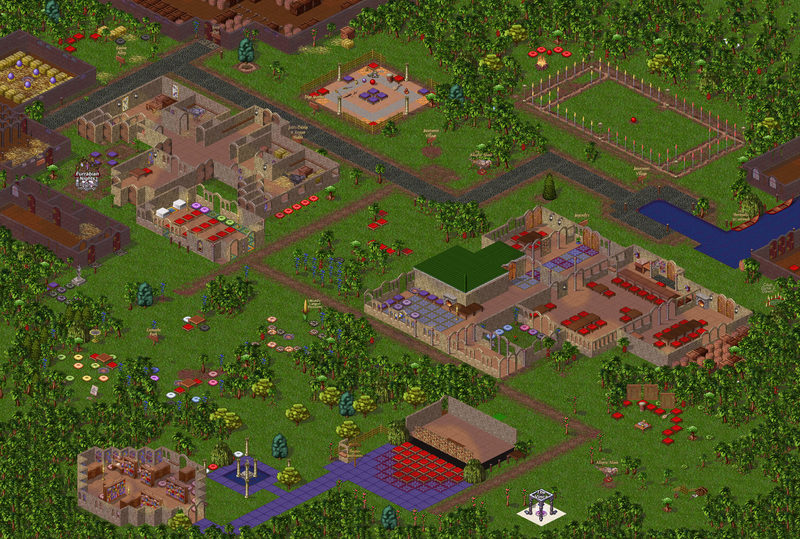 Enjoy fully 32bit shadows, and, thankfully, no more dithering! Anything you put here won't show when you go to upload your Dream! This is extremely useful for comments, doodles, arrows, and whatever else you want! Many of the tools you're used to are still around, but this modern Fox Editor has so many features to boast about! A whole year of development work! If you ever need to, you can also save as Legacy FOX to go back to editing your files in the old FSH editor, too! Size up, size down! This amazing Resize tool will automatically resize your patches! Choose from 4 options: xBR2x (used in arcade games), Nearest Neighbor (preserves pixel art), Hq2x (soft edges), or Bicubic (blurriest). 1 click of the Convert 32bit Remaps tool will redo all your old style remap tabs to the new format! This includes all walkabout poses, portraits, and specitags! Zooming now works on the improved Dye Recolors window, and it will also save color strings. Importing from Photoshop is easy with the new Image Import tool! 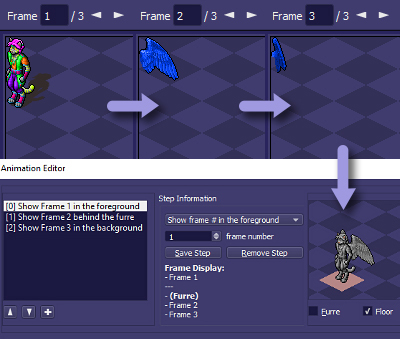 For animation, try the Import Frames tool. 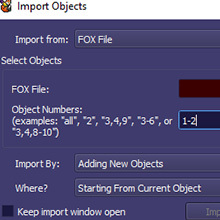 You also get several options to import from both Legacy fox files, modern fox files, and images! Most of the floating windows in FoxEd are now dockable to improve your workflow! Additionally, you can now zoom in and out, nudge art, and experience other enhancements for better usability. 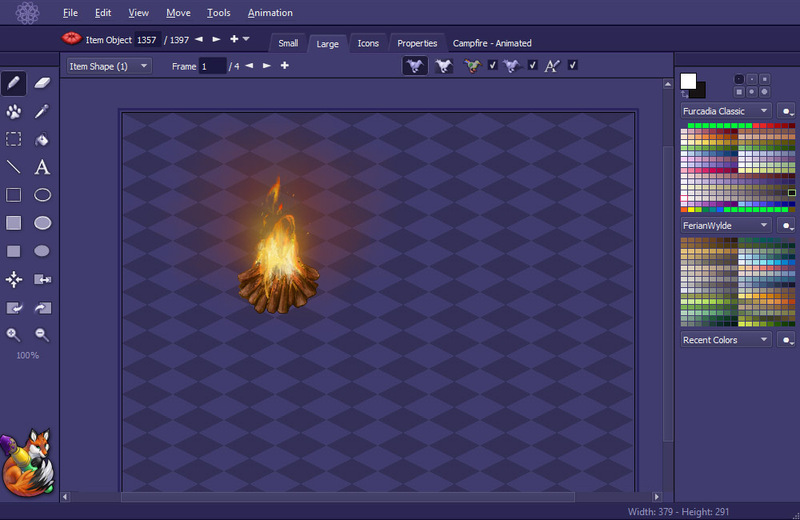 Making art MOVE is now so much simpler with the redesigned animation editor! Enjoy drag / drop / copy / paste Kitterspeak lines, new Kitterspeak Layering, and more! Custom backgrounds in FoxEd now help you build your patches! 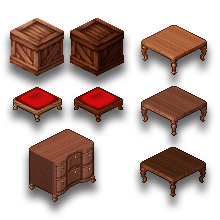 Use the floor grid to match isometric perspective, and there's borders for both specitags and portraits! No more pixely shadows! 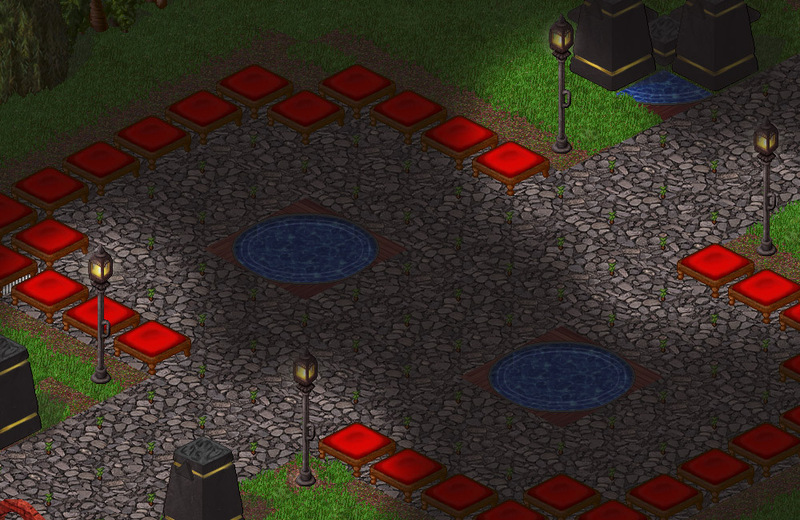 All it takes is 1 click and you can have a beautiful generated shadow! And for items with pesky dither shadows, use the new Remove dither shadows tool! Unify your Dream by using palettes! New premade palettes range from pastels to jewel tones and more. Create your own palettes by clicking on colors and watch it fill out on the Recent Colors palette! AI and Acropolis have combined into a brand new Allegria Island main map with a major facelift. This Medifurranean paradise is a brand new map of fun and sun amongst the ruins of the ancient Primes' temple. There's cliff climbing and diving, swimming in a tantalizingly gorgeous ocean, and all your favorite locations in the original AI and Acropolis have found new homes. Visit now! Challenges and Pineapple Lake Resort are sharing space on the C button as the new Challenge Resort main map! Fun games, activities for newfurres to do and more, it's a great place to hangout and welcome new players. You can even upload your game Dreams for others to play! Check it out! 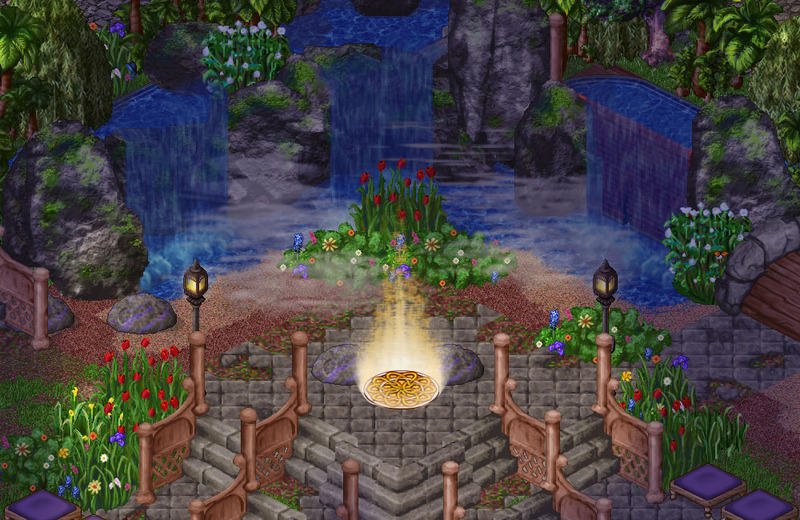 Vinca and its new island pair, Vohwa, are now lush with plant life, and feature mystical floating island base patches. Those with E8 thru T+ Standard costumes will appear in Vinca island, while those with M16+ thru AO Standard costumes will land in Vohwa! See it now! Look around for new day/night lighting effects in most main maps, including Naia, Olde Town, Wylde, Imaginarium, Meovanni, and FurN, with brighter colors, pretty 32-bit patches, and more, everywhere you look! With 32bit patches available, now you can explore a whole new dimension in your patches: Translucency! Enhance your Dream with new, broader color depth. 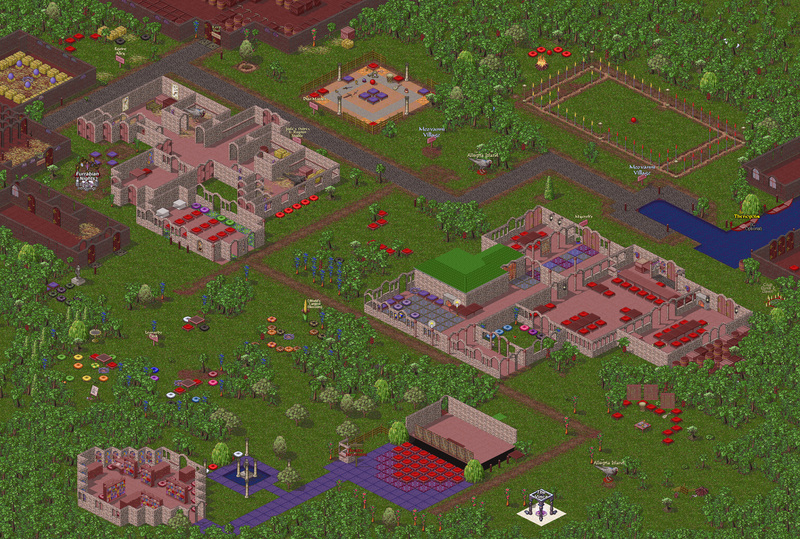 In all 20 years of Furcadia's history, never before has any update brought you so much new art to enjoy. And you can use ALL of it in your Dreams, for free! 6000+ Default patch pieces were created in 32bit for this update! Over 375 brand new items objects are now a part of the items.fox patch! Many never before seen patches are available, including floating island base pieces, cliff walls, potted plants, and more! Lots of other specialty main map patches are included as well. Portals are now their own file! It includes both the Dreampad (what you put down in your Dream to let people upload there) and the portal that appears when players upload their own Dream. Portals.fox gives you 36 new portal patches to use! We have gorgeous 16-frame water with realistic caustics! It spans across 4 separate tiles, with another set of 4 for deep-water, plus all the edging versions. They are included at the end of the effects.fox patch file. Enjoy! 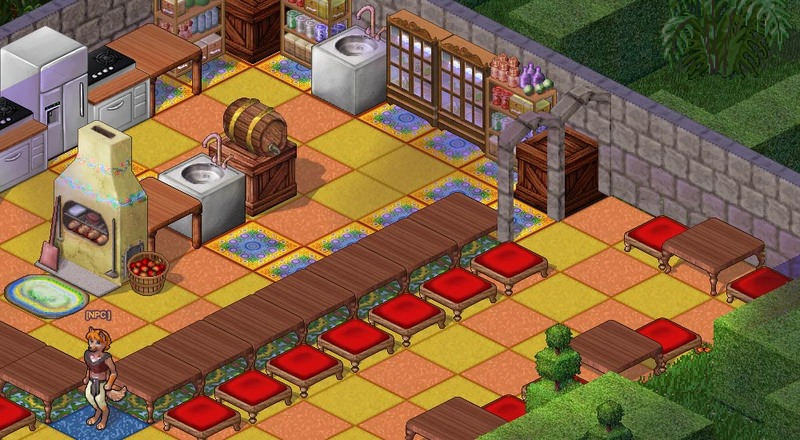 The entire floors file has been upgraded with things like richer wood colors, better cobblestone, and a complete set of animated water to bring your Dreams to life! Look, it's not pink anymore! Enjoy the rich and varied tones of the new default wood. Use the new FoxEd to make your own to match or contrast! From the soft flickering glow of a candle to the sundrenched highlight of a sunbeam, you can use the new lighting to add emphasis to scenes all over your Dream. Foggy nights, rave lights, golden hour or dawn, use the new ambience to give just the mood your Dream needs. There's even a full day/night cycle that is easy to use. 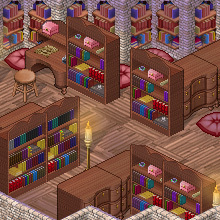 All the walls got a 32-bit upgrade but the original two wall sets were totally redone in rich colors and lovely details.Next update will see even more wall upgrades. Besides adding new ones, all the items were redone in both large and small sizes. That's over 3,000 items of beauty! You can use the new DreamEd to view them all. 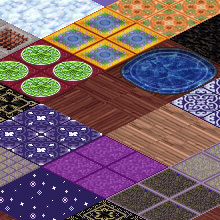 The floor tiles were painstakingly upgraded with more detail and deeper colors. There is longer grass, richer carpets, rippling water and more! Translucency played a huge role in the upgrade of the effects. No more dither - just smooth and beautiful effects. Think what you can do with this! The 32bit update brings new formats for remapping, shadows, and more, so in addition to the brand new free Default avatars, ALL the Digos were brought up to speed, while still retaining their classic charm! 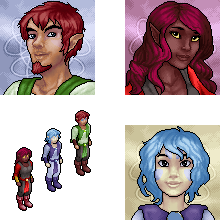 Badge, Hair, and Eye remaps now allow full shading, so this was incorporated into the avatars and portraits. 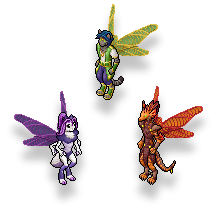 Many Mythicals and other Digos received extra Wing and Accent remaps to allow for further customization, while Portraits were adjusted to take advantage of full 32bit value in shading. Every Digo was carefully brought into 32bit, with some gaining translucency, animated movement, more remaps, and more details. The original mythical magic was remastered with 32bit colors and translucency, but keeps same familiar feel! The new FurEd wouldn't be the same without all the lovely large character art, would it? Those are large versions of something called a Butler in Furcadia (shows you when you're holding an item in your paws). They serve many purposes - for instance, you may have seen them on Digo Market ads! We've been working on Butlers for every Digo for a long time (130+ new ones this update! ), and now they make their official debut! Butlers are designed as interface pieces, so all their markings are outlined so you can easily tell where to click on them. They are part of Avatar Objects, too! Kitterspeak Layering is a brand new feature you can take advantage of in your Dreams! You now have 4 layers (+1 for the furre) which is handy for especially complicated objects that a player interacts with! All of this, just using KitterSpeak lines and animation layers. The only limit is your imagination! One of the biggest changes this update is the brand new Account Creation chain! Now you can directly create an Account through e-mail! There's brand new sign up page, download page, and also even an orphan character importer, for those who created alts in the past with no Account attached. Once your Account is created, you're taken directly to the web Character Create to create your first Character (which is now easy due to the new Name and Description generator!) Once you hit Play, you're instantly in the game! Accounts are now fully integrated into the login process! Once you login with your Account, you'll see all your Characters displayed, with their Portraits, and easily select which Costume you want to wear that day. The Newsfeed is now integrated along the side instead of being a popup, too! It has been a long haul with many false starts to get The Second Dreaming ~ Part 1 finished. Keeping things backwards compatible turned out to be more work than anticipated. We unexpectedly had to make new editors which added a year on the dev. We've had many staff and volunteers come and go. But at last - it is here and it is awesome! There is still a "Part 2" with double sized art uploads, new interface, web client, new dye colors and much more to come. For now, we have everything you need to get your Dreams ready for the second half of The Second Dreaming. 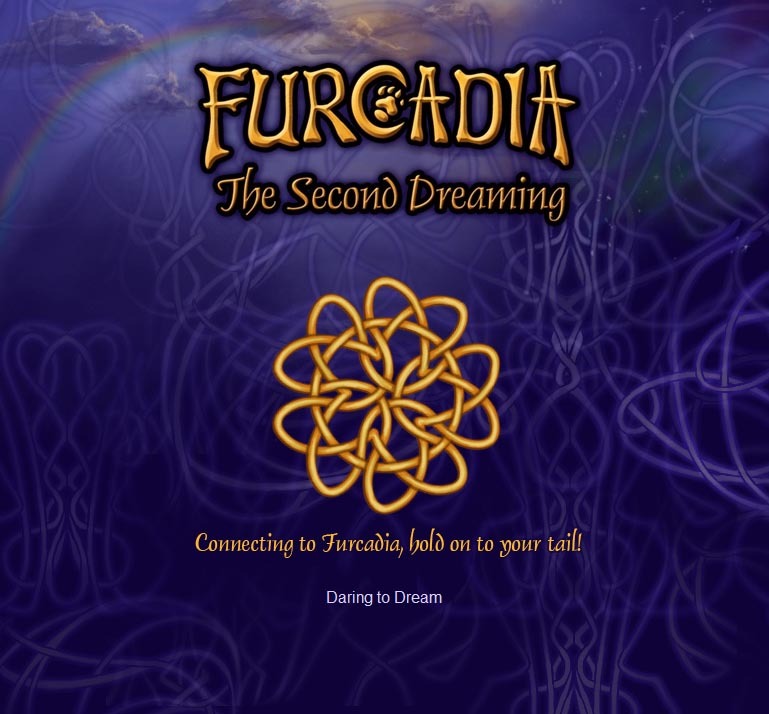 We hope you have as much fun with improving your Dreams as we've had upgrading the old Furcadia! Thank you to everyone who helped make this Update happen! Everyone here contributed by reporting potential bugs with Update 31a!